congratulations rachel! please email me your shipping address to aaronandmisha@gmail.com. 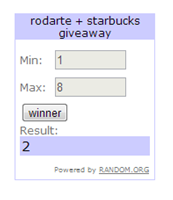 This entry was posted in giveaway, starbucks. Bookmark the permalink.